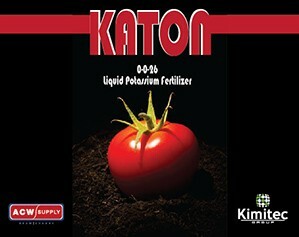 Kimitec Katon is a liquid solution, with a high potassium concentration, indicated for the prevention and correction of potassium deficiencies and favoring the ripening of fruits in the final stages of the crop. Kimitec Katon is a liquid solution, with a high potassium concentration, indicated for the prevention and correction of potassium deficiencies and favoring the ripening of fruits in the final stages of the crop. Since it is formulated with a high potassium concentration, and because it is a completely soluable solution, Katon provides the necessary potassium at times of maximum demand in a manner that is easily assimilated by crops. Kimitec Katon is chelated with EDTA granting easy assimilation into the plant. Katon is specially indicated to increase the yield of crops and improve fruit quality: sugar content, color, flavor, ripeness, hardness, preservation and consistency guaranteeing its shelf-life and storage. It is also recommended in cases of stress where the plant may have difficulties with potassium absorption (cold, heat, salinity and drought). Potassium is directly involved in the enzymatic processes related to ripening. Superior efficiency in foliar application for use in the most diverse conditions with regard to other potassium salts. Maximum profitability in the most diverse situations such as: situations of forced ripening, staggered production crops, hydroponic crops whenever nitrate contributions are to be reduced, etc.